Balloting for this election will remain open until 3:00pm CST on Monday, January 1, 2018. Andy Vitale is the Director of User Experience at Polaris Industries, a global powersports leader, where he is responsible for leading user experience design across Polaris’ innovative product lines. Andy is focused on translating human insights into actionable experiences that fuel the passion of riders, workers and outdoor enthusiasts. Andy holds a Master’s Degree in User Experience Design and has experience having held multiple roles as a designer, entrepreneur, education department chair, and design leader. With a proven ability to lead change and process improvements, Andy has developed strategies and design solutions for diverse organizations ranging from startups to Fortune ranked companies. He is a relentless user experience evangelist, with a passion for cognitive thinking and humanizing technology, driven by a user-centered passion that takes a team, and its products, from good to great. 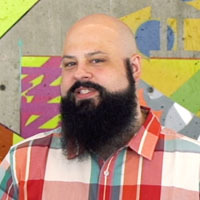 Aside from his primary role at Polaris, Andy is an adjunct professor for Kent State University’s User Experience Design graduate program and also serves as member of the UXPA Cleveland Senior Advisory Board and the Program Advisory Committee for the Graphic Design & Interactive Media Program at the University of Wisconsin-Stout. Andy often writes about design and speaks at conferences and events. The proposed ballot is now submitted to the membership of the organization for ratification; all Supporting, Sustaining, Leader, and Trustee Level members of AIGA should vote online by 3:00 p.m. on Monday, January 1, 2018. According to AIGA Minnesota’s bylaws, only supporting-, sustaining-, design leader-, and trustee-level members of AIGA Minnesota in good standing are entitled to vote in board member elections; contributor-level members and non-members are not entitled to vote.